We are about to treat you with a fun secret – for this recipe you do not have to make pasta, as easy as making pasta is, it is a bore if you don’t have a machine to help you. So instead we use wonton wrappers – pre-made into the perfect little rounds, cheap and available from Asian stores. We always buy a few packets and keep them in the freezer so always have to hand (whilst you are there stock up on fresh lime leaves and curry leaves, as you can keep these in your freezer too). This makes the tortellini very easy, yet still impressive to serve. The little parcels are rich and creamy and scented with autumnal spice, we are not doing anything radical here, they are a well known match, the sweetness of the pumpkin or squash works perfectly with the warming spice. We have then added our new find to the parcel – Smoked ricotta. Our eyes were out on stalks when we first saw it, you can get it from Natoora, and the super handy thing is that Natoora products are available online from Ocado, as well as many other grocery stores across London. We are big fans of Natoora, the original online farmers market, their produce is superb but it does come at a cost. They are worth checking out, we love their Speck (a smoked, cured ham) and their homemade pastas are great and make life easier! The smoked ricotta is such a fun addition, but if you can’t get hold of it then we would suggest gorgonzola or goats cheese would work equally as well. We often serve this as is - just with some melted butter and crispy sage leaves, the addition of toasted hazelnuts is also very welcome. When coming up with a Halloween menu we liked the idea of serving our spiced pumpkin raviolis in a scary dark broth, keeping it simple we decided to go for the earthy flavours of dried porcini which is a good balance with the sweet little parcels. If you are carving pumpkins this Halloween you could use the insides for this recipe, just roast it in the oven for the filling of the wontons. For the table decoration use a dark table cloth and dark linen napkins (habitat do a few options) and eat by candle light for the full effect. Ikea do a selection of traditional black metal candle sticks which come in a set at different heights which are perfect for elegant suppers, fun to go all out with black candles! Heat the oven to 200c. Roughly slice up the squash removing the seeds, but you can keep the skin on. Place on an oven tray and drizzle with olive oil, sprinkle with thyme and season. Place in the oven and roast for about 30 – 40 mins till soft and starting to caramelise. Take out the oven and scrape the soft insides into a bowl, discard the skins. Add the cinnamon, nutmeg, lemon zest, season and mash together, taste. 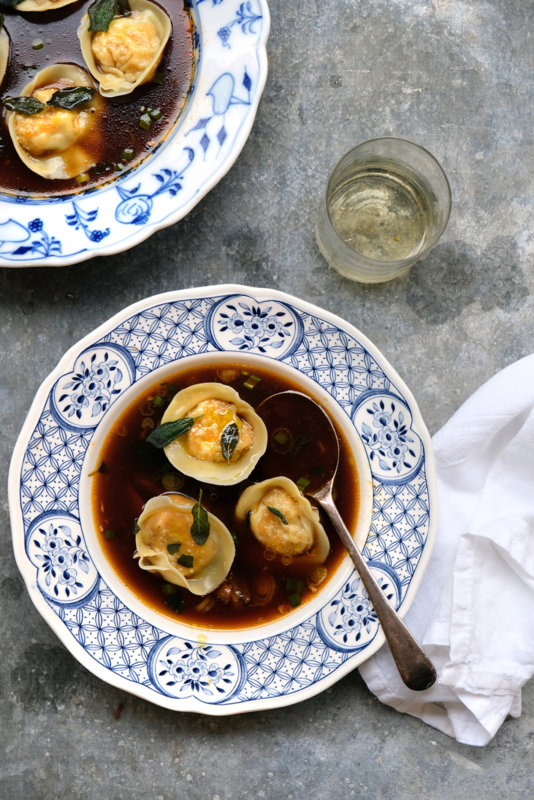 Arrange the wonton wrappers in front of you and spoon a teaspoon amount onto the wrapper then place a cube of the smoked ricotta on top. Fold into tortellini (this make take a couple of goes!). Dust a tray with semolina and leave the tortellini on top whilst you make the broth. (They will keep in the fridge covered for a good day or so). To make the broth heat a little oil in a pan and add the spring onions, add the stock, sherry and porcini mushrooms and simmer for about 15 mins, season and add a squeeze of honey. To make the sage leaves simply heat a little oil in a pan and add the sage leaves for about 20 seconds, remove and drain on kitchen paper. When ready to serve bring a pan of salted water to the boil and drop in your wontons, simmer for about 3 – 4 minutes and remove and distribute between bowls. Spoon the broth over the top and finish with the crispy sage leaves.